Next time you’re in a crowded place, take a look around. You’ll see dozens of people with their heads down, eyes focused on mobile devices, with thumbs tapping away at little screens. What are they doing? Texting, of course. So if people are constantly texting, why isn’t your hotel? As we discussed in a recent blog post, people are downright obsessed with their smartphones. And what’s the most popular smartphone task? Texting. Smartphone users take their phones with them everywhere they go. Nine out of 10 respondents to a Pew Research Center study said they frequently have their phone with them, while only three percent of young adults turn their phone off on a regular basis. Around half of the people – 48 percent – rarely turn their phone off and 34 percent never do. When you look at business travelers, you’ll notice that 95 percent own a smartphone – and two-thirds of these travelers shop, explore, and book travel activities via a mobile device. Here’s what all of these data points tell you: The average person relies heavily on their smartphone to stay connected and prefers to use it – especially while traveling – to alleviate friction points that may exist. Airlines are taking full advantage of SMS – is your hotel? When we discuss SMS with hoteliers all over the world, we almost always discover that low SMS adoption rates are rooted in a lack of consumer education. Hotels simply don’t know how SMS is supposed to be used – or where the value lies – and stick to traditional methods of marketing, customer service, and communication. WiFi is a big deal for hotel guests. They expect free internet and want to be able to log on to your network. You want to be able to provide this convenience but can’t leave your network unsecured for fear of unnecessary exposure. Most hotels include a WiFi password in their check-in booklet or place small placards in rooms, but these resources often get overlooked. As such, guests get frustrated and bombard your front desk with questions about logging onto the WiFi. Travel can be expensive and guests are always looking for ways to save money. You can partner with local businesses and set up deals where you send your guests coupons to their establishments. This is perfect for restaurants and attractions and allows you to better serve your guests during their stay. Hotels are always asking for feedback so they can know what they’re doing right and what they could be doing better. However, very few people take the time to fill out a paper survey or answer questions online. Most hotels send reservation confirmations to guests via email. And while there’s nothing wrong with this, emails tend to get deleted, lost, or even sent to a recipient’s spam folder. You can avoid these issues by sending confirmations to guests via SMS. You can even allow guests to check-in online using a special link that you send them in advance. This speeds up the process upon arrival and allows you to better serve more guests. Are you hosting a conference in your hotel? Is there a big event that people are attending? You can provide better service to your guests by sending them event information – such as itineraries, directions, contact information, and even weather updates. These small touches can really enhance your hotel’s image as a guest-centric establishment. Room service is based entirely on the premise of convenience. Thus, if you can find a way to make your hotel’s room service more convenient, you should certainly seize the opportunity. While it doesn’t take much effort to place a phone call to the front desk, many guests would prefer the convenience of sending a text. With the right SMS platform, this can be done very easily. Provide guests with a room service number they can text and then use automated prompts to help them place an order. Should there be any issues, you can always call them back to clarify details. From retail and entertainment to healthcare and finance, SMS can be used in just about any industry. However, few industries have as much potential as travel and hospitality. 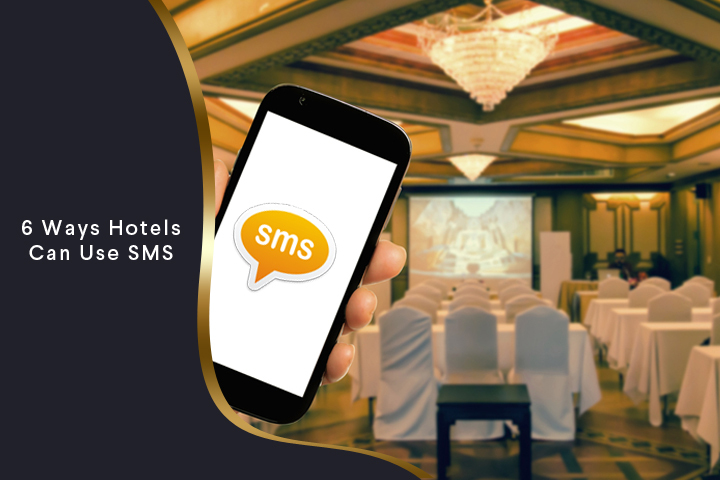 As a hotelier in today’s marketplace, SMS offers you a chance to diversify your value offering and engage guests like never before. If you’re interested in learning more about what this looks like and how you can integrate SMS into your business plan, then please contact us today!